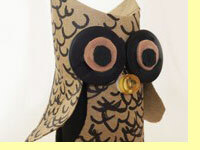 If you think of an owl, one thing comes to mind: big round eyes! Thats the concept we can use to create this owl. Let's try it. 3. Buttons, usually the bigger the better. It can be any colour, to give it an even interesting and fun feel. 5. Two colours of foam sheets (2 or 4 millimeter thick) You can also use a hard card. First, flatten out the paper roll a bit, mark out the wings and cut it with the scissors. Make sure you do not cut it all through. 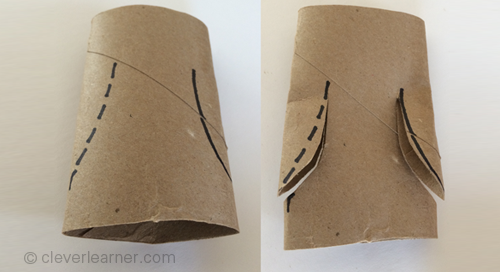 Knock in the top-side of the roll and rub your thumb on it to smoothen the curves. Do the same for the other side and rub the rough edges to get a smooth depression on the top. That forms the ear of the owl. 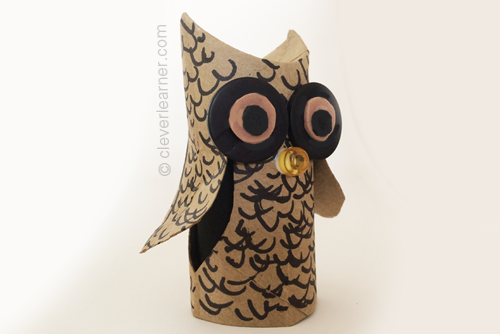 Now, get the marker (any colour of your choice) and make a texture design to represent the feathers of the owl. Do this on the entire roll. Now, cut a piece of the foam sheet, about 2.5x4.5 inches and stick it into the paper roll to give it strength (make it sturdier). This way, when you lift the wings up, the hole from the cut-out will be covered by the foam-sheet. Make sure you push it all in. Now, lift the wings up a little bit. Get the eyes you made (hopefully they are dry by now). 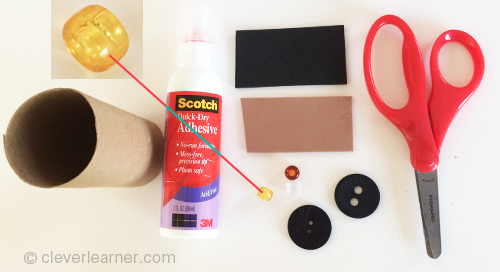 With your glue, stick the eyes on the paper roll and ensure that it dries. Plastic buttons do not stick very quick so be patient here. After that stick your bead on it to make the beak. Tadaaaa... owl! Hope you liked this. 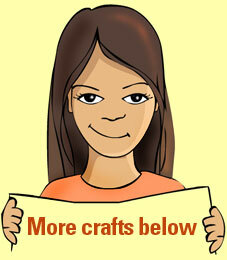 There are many materials that you can use for this craft. The win is in the eyes, so try to get some big eyes and your are gone! Have fun.